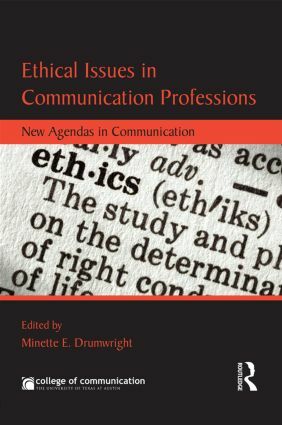 Dynamic, rapid, and radical changes are transforming the communication professions, provoking major implications for ethics. Traditional boundaries blur as media converge; relentless competitive pressures cause some forms of communication to atrophy and permit others to explode; and technological advances occur daily. In this volume, a new generation of scholars take a fresh look at the manner in which ethical issues manifest themselves in their areas of research and suggest new agendas for future research. This book addresses a wide range of questions from a variety of communication professions. Contributors tackle such issues as how to define a journalist in an era when anyone can disseminate information to a global audience; how to use "advergames," crowdsourcing, and facial recognition technology in advertising responsibly; and how to respond ethically in situations of public crisis communication, among many others. This volume will be critical reading for scholars and professionals in media, communication, and digital arts, as well as philosophy, government, public policy, business, and law. 4 The Case of Media Violence: Who is Responsible for Protecting Children from Harm? Minette E. Drumwright is Associate Professor in the Department of Advertising and Public Relations, College of Communication, University of Texas at Austin. Her research is in the areas of ethics in advertising and public relations, corporate social responsibility, and communication for non-profit organizations. Her work has been published in a variety of journals and books.